ST. GEORGE — The Utah Dixie Detachment 1270 Marine Corps League will celebrate a decade of Semper Fidelis with a “Scholarship Fundraiser” anniversary dinner open to the public Saturday. 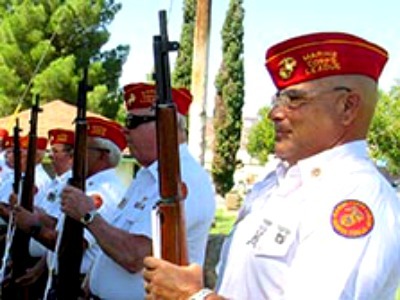 While the world was focused on the announcement of the revolutionary Apple iPhone, another extraordinary event occurred in January 2007 when the Utah Dixie Marine Corps League became a Southern Utah institution and formidable force for good. Funding raised through a silent auction during Saturday’s dinner will benefit the Rick Backman Scholarship Fund, one of many charities in Southern Utah that benefit from the detachment’s efforts. Created three years ago with a generous donation from Claudia Backman, Rick Backman’s widow, the fund provides support for Marines and Navy corpsmen attending Dixie State and Southern Utah universities. Scholarships will also be presented to two Dixie Air Force junior ROTC cadets attending Dixie High School and Pine View High School as seniors, the first presentation of its kind in the Detachment’s history, Bill Fortune, retired Marine and spokesman for the detachment, said. The dinner and silent auction will be held at the SunRiver Ballroom starting at 5:30 p.m. The public is encouraged to attend at a cost of $25 per person. Ten years ago Marines living in Southern Utah decided they needed to organize and by February 2007, they received their charter as Detachment 1270 of the Marine Corps League and subsequently became the largest detachment in the state. The Utah Dixie Detachment 1270 Marine Corps League provides an opportunity for its members, Marines and Navy corpsmen who serve with the Marine Corps both active and nonactive duty, to continue their service to their country and community. Ten years after the organization’s inception the membership has grown to more than 100 members, Fortune said. Over the last decade the Detachment has participated in hundreds of color guards, flag raising ceremonies, parades and more than 150 funerals where military honors for their fallen comrades were rendered. The Detachment also supports the local “Toys for Tots” program every Christmas, along with many charitable activities such as Marines/Families in Distress, Sheriff’s Office Explorers, The Devil Pups Program, Veterans Home in Ivins, Dixie High School Jr. ROTC and many others throughout the year. The first celebration dinner was held Jan. 23, 2007, while the detachment was still in the organizational phase. Marine Lt. Col. William “Bill” Toole, the detachment’s first commandant, chose Mexican cuisine as opposed to the traditional “Tun Tavern fare of 1775 fame,” Fortune said. The Marine Corps League was one of the earliest established Veterans Organizations, organized in June 1923 and chartered by an Act of Congress in August 1937. The purpose of the Marine Corps League is to preserve the traditions and history of the U.S. Marine Corps while banding together those who are serving and those honorably discharged in fellowship. The league encourages its members to serve as citizens as they have served their nation under arms and to aid and assist all Marines, Corpsmen and Navy Chaplains, as well as their widows and orphans. For tickets contact Ken Olsen at telephone 435.628.4623 or by email. 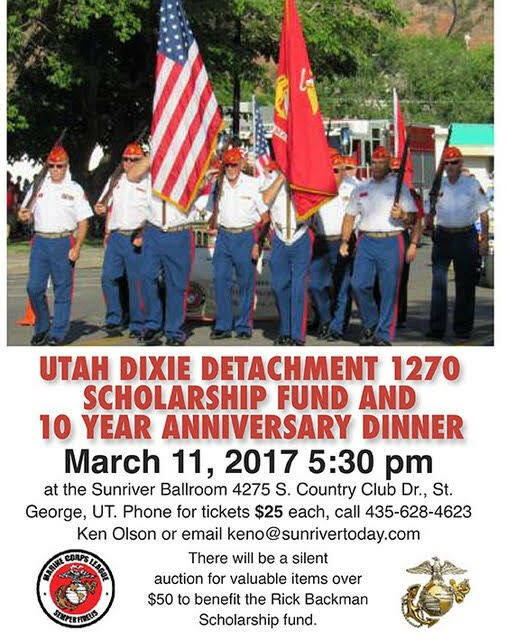 What: Tenth annual Utah Dixie Detachment 1270 Marine Corps League anniversary dinner. When: Saturday, Mar. 11, 2017, 5:30 p.m. to 9 p.m.
Where: SunRiver Ballroom located at 4275 S. Country Club Drive, Saint George UT 84790. Cost: Dinner is $25 per person; beef or fish entrees available.